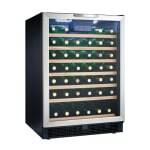 The Danby DWC508BLS one-section wine cooler can be built into cabinets or left freestanding, while the interior accommodates 50 wine bottles. Its wire shelves have beechwood faces that slide in and out of the unit for accessibility. For precise temperature control, the digital thermostat is adjustable from 39.2 to 64.4 degrees Fahrenheit, and it has an LED display to monitor and control temperature. 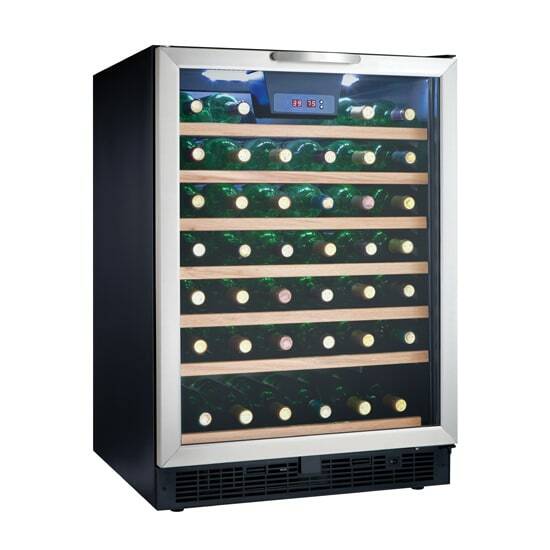 The Danby DWC508BLS wine cooler's tempered glass door enables viewing, while the LED lighting illuminates the interior to showcase wine bottles. If you're looking for more information on wine merchandisers, check out our explainer on wine merchandisers.